Viking Cruises has begun its advertising for the 2015-16 maiden season of its 930-guest 47,800-ton Viking Star, a ship that promises to move in a new direction in the contemporary world of cruising. Viking promises to steer away from mega ships and the superficial glitz that has become too common, and back traditional cruising. At the same time, another of the new wave of more traditional cruise ships, Oceania Cruises’ 1,258-berth 66,048-ton Riviera, has been attracting attention at Reviewed.com and at USA Today, which wrote up the review. Meanwhile, last week saw one of the last of the traditional ships, the Saga Ruby, complete her last cruise after a career of forty-one years. Finally, the Akademik Shokalskiy, now freed from the ice of the Ross Sea, will be able to take up this Friday’s expedition voyage from Bluff after all. The cruise line that promises to bring back cruising as it should be has to be Los Angeles-based Viking Cruises, whose first ship of six (four on order, two options), the 47,800-ton 930-guest Viking Star, enters service in May 2015, with a maiden voyage from Bergen. No mammoths, no leviathans, no silly attractions, no loud crowds, no huge drive for on board spend, no children, just cruising as it should be, with the sea and with destinations in mind. With a passenger space ratio in excess of 50 tons per passenger, these will be spacious ships, offering five stateroom categories raging from 270 to 1,448 sq ft, the latter for a two-room Explorer Suite. 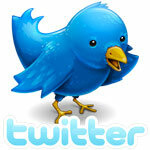 They will also strike just the right tone of inclusivity combined with a concentration on destinations. Like Regent Seven Seas, Viking will include shore excursions – but only a set number. And unlike Regent’s stable mate Oceania, Viking will include complimentary house wine and beer with lunch and dinner, where all drinks on Oceania are extra. The Viking mix will be unlike any line that’s in business now save for some of the small ship companies. They also state that all meals are included along with 24-hour complimentary tea and coffee. Sample itineraries include the “Romantic Mediterranean,” 8 days from Barcelona to Rome (with 8 tours), from £1,749 per passenger in double occupancy, “Viking Homelands,”15 days from Stockholm to Bergen including St Petersburg (11 tours), from £3,499 and “Passage Through Western Europe.” 15 days from Bergen to Barcelona, from £3,299. The ships are being built by Italy’s Fincantieri. Meanwhile, late last month, USA Today reported on a review of Oceania’s Riviera of 2012 at Reviewed.com. 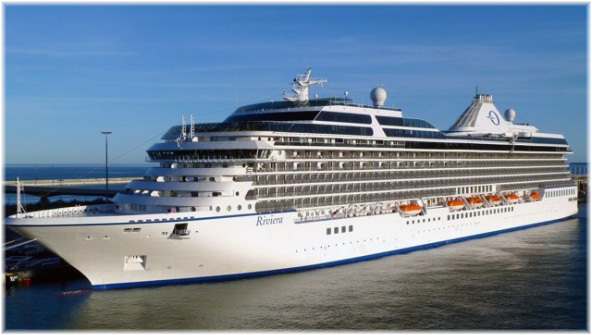 The review site ran quite a detailed review of Oceania’s latest ship and sister of the Marina, completed in 2011. But according to the reviewer’s calculations, with fares all obtained on the same day, the Riviera may be overpriced. This is an interesting point as while some complain about the price of drinks on board, the new Oceania sisters seem to be attracting a pretty good following. “Riviera’s veranda cabins for Mediterranean cruises averaged about $455 per day, per person—a fare that does not include gratuities or drinks, costs that can top $75 a day, per person (Riviera’s auto-gratuity is $15 to $22 per day and the all-inclusive drink package runs $59.95 per day). “By contrast, during the same timeframe, similar Mediterranean itineraries aboard Crystal Serenity averaged $560 per day for a comparably sized veranda cabin, including gratuities and drinks. Silversea’s Silver Spirit priced out at an average of about $570 per day, including gratuities and drinks, and for a cabin almost 50 percent larger than Riviera’s veranda units. Cabins on Seabourn Odyssey or Seabourn Sojourn averaged $650 per day including gratuities, drinks and all dining—again, for a cabin almost 50 percent larger. The fact that the line’s CEO, Frank Del Rio, was born in Cuba may be an influence here. Last Friday, the 24,182-ton Saga Ruby left Southampton at the end of a forty-one-year career as a cruise ship. Because of bad weather in the Bay of Biscay, she had been two days late returning from her final month-long cruise, which had seen her destination changed from the Caribbean to the Mediterranean after a generator failure at Tenerife. Completed by Swan Hunter at Newcastle-upon-Tyne in 1973 as the Norwegian America Line’s Vistafjord, she was the last passenger ship to be ordered by that line. Later, after her purchase by Cunard Line, she became the Caronia, before ultimately going to Saga as the Saga Ruby. At Saga, she joined near sister ship Saga Rose, which as the Sagafjord had been her fleetmate at NAL. 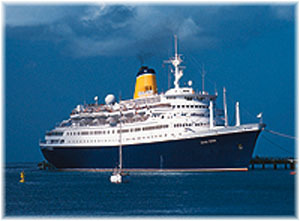 The Saga Ruby, the last important British-built passenger ship, had a longer career than famous British liners such as Cunard Line’s Aquitania and P&O’s Canberra (both 36 years) as well as Cunard’s Queen Elizabeth 2 (39 years). But she did not quite beat the 45-year longevity of one of her own predecessors, the 12,977-ton British-built Stavangerfjord of 1918, which made her last voyage from New York to Bergen and Oslo in December 1963. Saga Ruby has been sold to unnamed Asian buyers who apparently plan to turn her into a hotel at Singapore and she left Southampton bound for Gibraltar. Her place in the Saga fleet has been taken by the 18,591-ton Saga Pearl II, which has moved over from the Spirit of Adventure brand, where she had been sailing as Quest for Adventure. 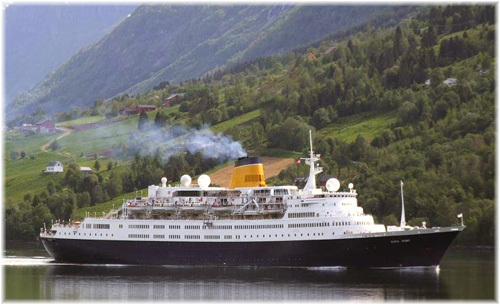 Flagship of the Saga cruising fleet is the 37,301-ton Saga Sapphire, built in 1982 as Hapag-Lloyd Cruises’ last Europa. Last week, we reported that the Akademik Shokalskiy, stuck in ice in the Ross Seas in Antarctica, was due to sail on a special expedition voyages for Heritage Expeditions of New Zealand and at the time it seemed like there might be a chance she would not make it. A few days later however came the news that the prevailing winds had changed direction and both the Shokalskiy and the Chinese icebreaker she was trapped with had been able to make their way to open water. The Akademik Shokalskiy, which has operated for Heritage in the past, is now on her way to Bluff to take on her 48 intending passengers for that special voyage, “In The Wake Of Scott And Shackleton,” which had been scheduled for this Friday, January 17.